He played in the Rangers’ first three playoff series. Won a record 13 Gold Gloves as a catcher. Holds the Major League record with 2,377 games caught, started 12 All-Star Games and won seven Silver Slugger Awards. In an era where the league average for throwing out base-runners was 31 percent, eight times he led baseball by gunning down more than 50 percent. 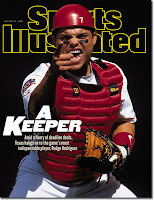 In 1999, he was the American League Most Valuable Player. 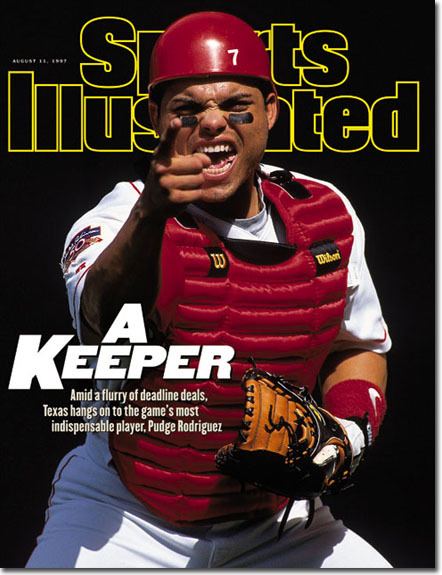 And from the time he arrived in Arlington as a 19-year-old in 1991 he set the standard for Rangers’ catchers past, present and future. 14. Rusty Greer - Did he ever catch a fly ball without diving? Can't say I disagree with this list other than two minor things. Woulda put Young in front of Juando and according to a previous list woulda put Iverson ahead of ARod. Pound for pound he woulda been better since he was ahead of Russell and Wilt in a previous list. Nolan ment more than Wetteland ever did. Wednesday...the DH: Yes or No. 90 complete games for Fergie Jenkins. That must have been some weed he was smoking that year. stick w/b-ball, cause you don't know jack about baseball. Buddy Bell could have made this list 5 years ago. Not today. Not even close. "20. Alex Rodriguez - If he wasn't a 'roided-up a-hole he'd be much higher"
Then your top 5 contains 3 noted juicers.